ENJOY LIFE focus on provide safe and high quality oven glove、aprons etc kitchen home textiles products, make our clients can enjoy a safty, comfortable cooking. This high quality flamingo pattern transparent silicone oven glove adopt attractive double-layer design with soft transparent silicone material outside and flamingo pattern printed cotton fabric inside.This design combine the heat insulation and anti-slip functions with fashionable printing together, which make it high end, soft and safty. 1. 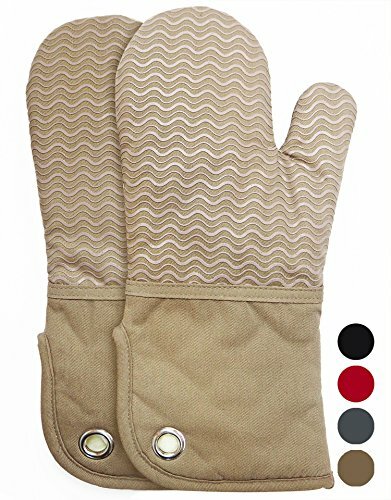 LONG-LENGTH: Our Home kitchen silicone printing oven mitt with a longer length 7 X 13.5", are widely used for cooking, barbecue, microwave oven, soup cooking and so on. It brings you and your family a better protection. Can keep you away from steam scald, make your cooking time easy and safe. 2. ECO-FRIENDLY AND HEAT-RESISTANT: We use FOOD GRADE silicone printed on the cotton fabric with nice wave design, Offering protection up to 450°F, lowest Cold to -50°F. Well protect your hands and wrists from burns. 3. ECO-FRIENDLY AND HEAT-RESISTANT: We use FOOD GRADE silicone insulation material, Offering protection up to 500°F, lowest Cold to -50°F. Well protect your hands and wrists from burns. 4. TEXTURED, NON-SLIP GRIP: With Diamond texture pattern and 0.8mm prominent height on palm surface silicone shell , which is not only for better heat resistant, but also with stable and Non-slip grip of all cooking tools, special for heat resistant and waterproof. 5. COMFORT AND FITNESS: We use eco-friendly and high quality silicone material for outer, soft polyester cotton for filling and durable TC fabric for lining.making it comfortable feeling and flexible grip. 6.MACHINE WASHABLE: This silicone oven glove is machine washable and reusable, which directly decrease your using costs. Surface dirty, Simply clean with water. It is your prefered choice for cooking and as a gift to your friends and family. LONG-LENGTH: Our Home kitchen silicone printing oven mitt with a longer length 7 X 13.5", are widely used for cooking, barbecue, microwave oven, soup cooking and so on. It brings you and your family a better protection. Can keep you away from steam scald, make your cooking time easy and safe. ECO-FRIENDLY AND HEAT-RESISTANT: We use FOOD GRADE silicone printed on the cotton fabric with nice wave design, Offering protection up to 450°F, lowest Cold to -50°F. Well protect your hands and wrists from burns. TEXTURED, NON-SLIP GRIP: With wave pattern silicone printing on the palm surface, which is not only for better heat resistant, but also with stable and Non-slip grip of all cooking tools. COMFORT AND FITNESS: We use eco-friendly and high quality silicone material for outer, soft polyester cotton for filling and durable TC fabric for lining.making it comfortable feeling and flexible grip. MACHINE WASHABLE: This oven glove is machine washable and reusable, which directly decrease your using costs. Surface dirty, Simply clean with water.